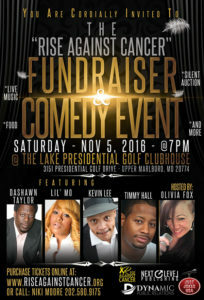 (September 9, 2016 – Upper Marlboro, MD) Rise Against Cancer, Inc., a nonprofit organization created to raise awareness about cancer, especially sarcoma cancer, will present the Rise Against Cancer Fundraiser and Comedy Event at the Lake Presidential Golf Course Clubhouse in Upper Marlboro, MD on November 5th. The American Cancer Society defines sarcoma as a type of cancer that develops from certain tissues such as bone or muscle. Soft tissue sarcomas can develop from fat, muscle, nerves, fibrous tissues, blood vessels, or deep skin tissues. Sarcoma is one of rarest forms of cancer, and it is a battle against which Aleasha Arthur, founder and executive director of Rise Against Cancer, is fighting. Arthur is undergoing treatment at the Maryland Proton Treatment Center (MPTC) in Baltimore. She has been treated by Dr. Pranshu Mohindra, assistant professor of radiation oncology at the University of Maryland School of Medicine. “With proton therapy, especially with the modern pencil beam scanning technique used at MPTC, a radiation oncologist [a doctor that treats cancer patients] can increase the radiation dose so that the tumor gets the most effective treatment possible,” said Dr. Mohindra. “Since Ms. Arthur’s sarcoma was gynecological in origin, measures were taken to reduce radiation impact to normal pelvic organs such bas bladder, bowel and ovaries. [These measures included] avoiding a high dose of radiation on healthy organs and tissues nearby, which was critical for [Ms. Arthur],” Mohindra continued. Despite undergoing treatment daily, Arthur is devoting her strength and courage to planning an event of this magnitude. She serves as a beacon of hope to everyone who knows her. This unforgettable night will include lots of laughter, live music, a celebrity-style red carpet, refreshments, a cash bar, a silent auction, and cancer survivor awards and acknowledgements. Dress attire is semi-formal. 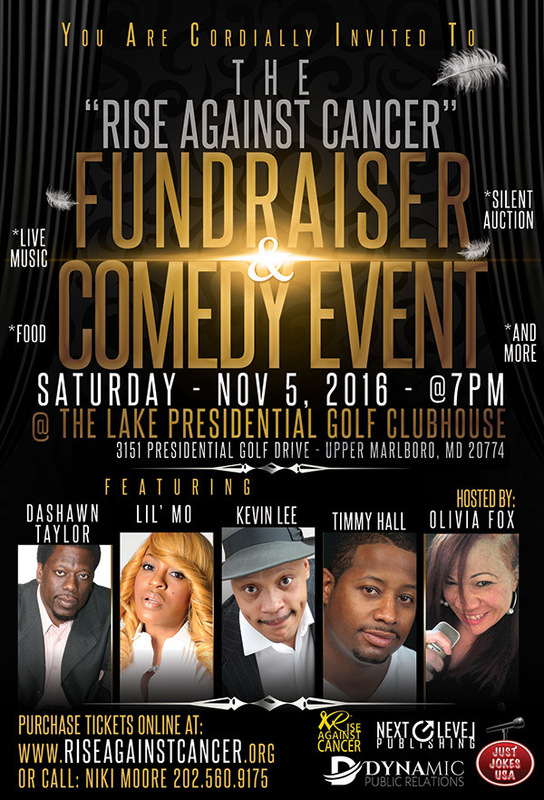 The Lake Presidential Golf Course Clubhouse is located at 3151 Presidential Golf Drive, Upper Marlboro, MD 20774. For information about purchasing tickets and supporting the cause by donating, please visit us at www.RiseAgainstCancer.org. For sponsorship and vending opportunities, contact Niki Moore at (202) 560-9175 or Dashawn Taylor at (973) 634-8421. You can purchase tickets to this event here!